One To One Printing was opened in July 1998 by Steven & Nicole Culos. The main objective of starting One To One Printing was to supply quality printed products at a competitive price with personalized service. This objective is one that we have continued to follow over the years and we strive to continue to do so. This attitude has attracted new clients and encouraged existing clients to continue with us. One To One Printing uses Soy based inks and has access to a large assortment of recycled paper if you require environmentally friendly products. 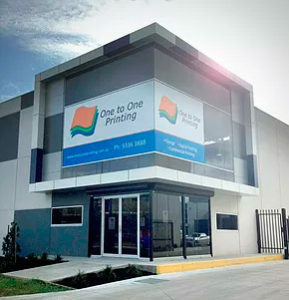 In 2014 we moved into our new modern offices and adjoining factory in Keilor Park. Continued growth of One To One Printing, with new printing and binding machinery enables us to control work in house, giving us total quality control over your product. With clients Australia wide, we have no problem in delivering your order wherever you are in Australia.